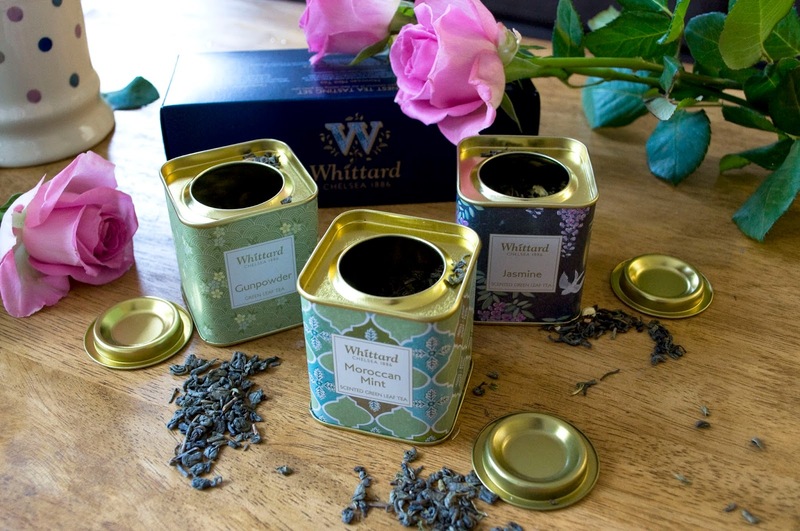 Heres' another post about some of Whittard of Chelsea's beautiful teas. I'm so impressed with their website and products and they definitely have some lovely packaging. As you can see with this photo below, this is a green tea selection with Jasmine, Gunpowder and Moroccan Mint tins and they come in a lovely blue Whittard box as a trio. I found this tea collection on the 'tea gifts' sub-heading at £10 each, but you can also buy each flavour loose by itself. 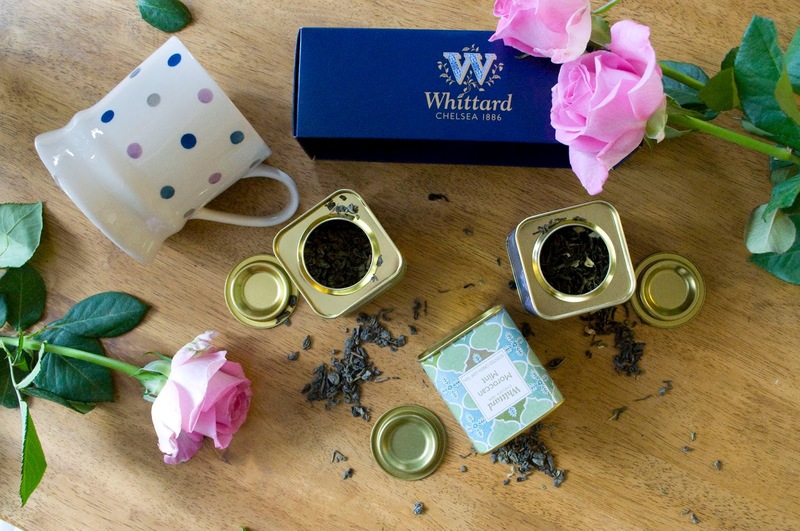 How nice are these little tins?? Note the polkadot tea mug, from the same collection as the cup and saucer that i've featured before. I love this style! It's only £4 which isn't bad considering it's dishwasher safe. I did my tea tasting on a separate day while there was a bit of sun to be enjoyed outside. The Moroccan Mint was perfect here as it's very refreshing on a warm day. It's spearmint flavoured green tea so it has a bit more body than purely herbal mint tea and is probably well-suited to those who find herbal mint tea too wimpy for them! It's surprisingly sweet so although sugar might be a nice addition, it isn't necessary. 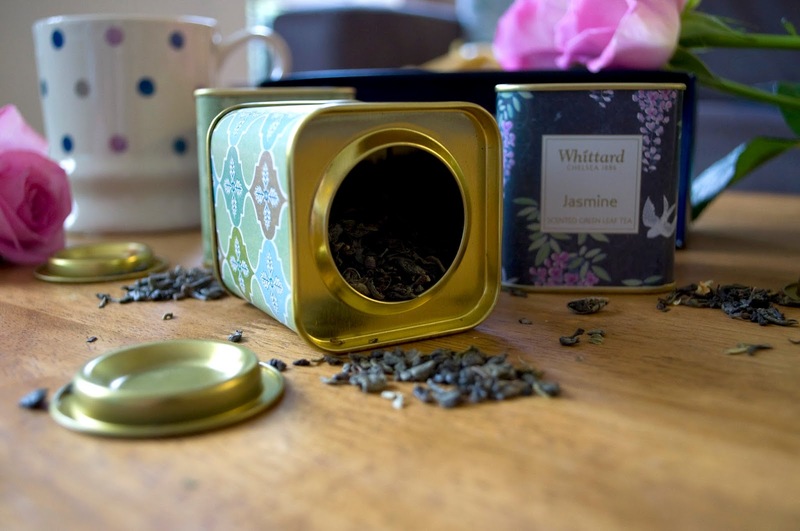 I got my tasting pots muddled up so I drank the Jasmine and Gunpowder Green tea blind. This was a good test as you taste it for what it is rather than what your mind expects. The Jasmine Green tea was delicately flavoured and although I didn't feel a 'hit' of jasmine, I did note a floral, almost fruity flavour. Very nice, but I had to be careful not to over-brew it into a bitter tea. I found the Gunpowder green tea to be slightly smokey but apart from that I wasn't getting much flavour from it. However, i've looked online and there's some great reviews for this tea so I think I might need to practise making it right for my taste. It wasn't intentional but i've used my cracked teacup here. Since i'm reading a book on Wabi Sabi, i'm testing the theory out and embracing imperfections!